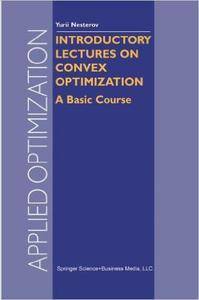 Yurii Nesterov, "Introductory Lectures on Convex Optimization: A Basic Course"
It was in the middle of the 1980s, when the seminal paper by Kar­ markar opened a new epoch in nonlinear optimization. The importance of this paper, containing a new polynomial-time algorithm for linear op­ timization problems, was not only in its complexity bound. At that time, the most surprising feature of this algorithm was that the theoretical pre­ diction of its high efficiency was supported by excellent computational results. This unusual fact dramatically changed the style and direc­ tions of the research in nonlinear optimization. Thereafter it became more and more common that the new methods were provided with a complexity analysis, which was considered a better justification of their efficiency than computational experiments. In a new rapidly develop­ ing field, which got the name "polynomial-time interior-point methods", such a justification was obligatory. Afteralmost fifteen years of intensive research, the main results of this development started to appear in monographs [12, 14, 16, 17, 18, 19]. 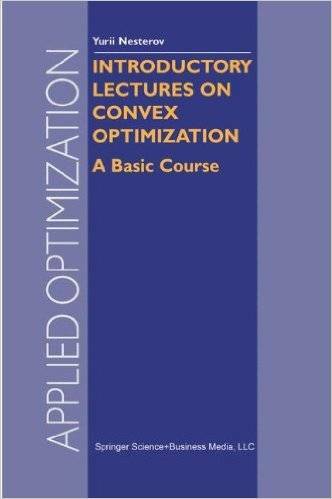 Approximately at that time the author was asked to prepare a new course on nonlinear optimization for graduate students. The idea was to create a course which would reflect the new developments in the field. Actually, this was a major challenge. At the time only the theory of interior-point methods for linear optimization was polished enough to be explained to students. The general theory of self-concordant functions had appeared in print only once in the form of research monograph .